AirBnB wants you to stay in someone else’s house. Lyft wants you to order up a ride with someone you don’t know. Relay Rides goes a step further and wants you to borrow cars from people you don’t know or — shudder to think — loan your car to a complete stranger. There’s collaborative fundraising, food preparation, clothing and other goods. Everything from loans to leftovers has some sort of collaborative app or approach today. Welcome to the collaborative economy. Jeremiah Owyang is one of the analysts (if not the only one thus far) leading the charge in celebrating the collaborative economy. He likens it to social media in 2004 and points to many companies raising ridiculous rounds of funding to show its traction. We spoke recently and I pointed out to him that the rest of the world — the one outside of Sillycon Valley — looks at those points and just laughs. Social media was about connecting people for social utility. The collaborative economy seems to be focused on talking people into sharing their stuff with absolute strangers. There’s a vast difference there. Crowdsourced funding? Cool. Random peckerhead sleeping on my couch? Not going to happen. Also, Silicon Valley is well known outside the Bay Area as the one place where a company with no sustainable business model can be valued at or raise infinitely more money than they’ll ever actually be worth. Rounds of funding is money raised. What the rest of the world wants to see is money made. Big difference. But Owyang points to key market forces of societies desire to connect, a broad mindset of sustainability and the never-ending population increase (Societal Drivers); the post-recession financial climate, a market of untapped and idle resources and heavily funded startups in this space (Economic Drivers) and Technology Enablers of social and mobile networks that fuel the Internet of everything. These three bucket drivers are behind the collaborative economy and while the companies are certainly over-funded and seem to be bubbles waiting to happen, the business model begets the reason. 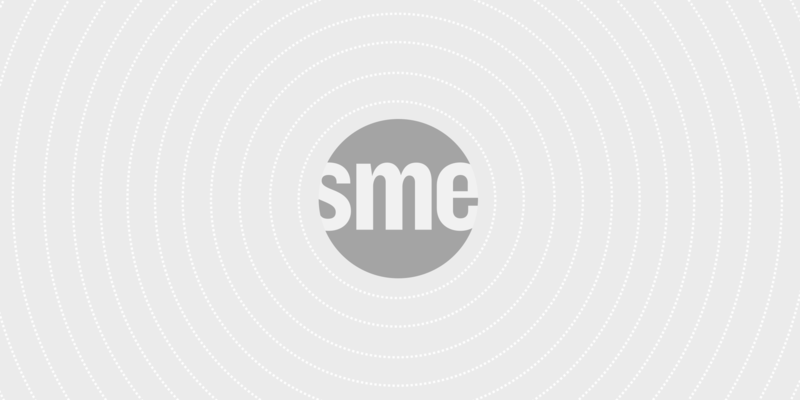 Most collaborative companies operate on a two-sided market. They take a fee from the buyer for finding the product. They charge a fee to the seller for finding a buyer. They are a service (think Ticketmaster) that doesn’t own either end of the transaction. They only orchestrate it and charge fees for it. There’s no overhead and lots of potential revenue. The gamble is that enough people will use these services in a growing and sustainable way that one day we’ll be bitching about AirBnB’s exorbitant fees to couch surf. Maybe Pearl Jam will protest them, even? Don’t be fooled however. People are quick to say Craig’s List and Uber are collaborative. Sans Uber’s recent ridesharing off-shoot, it’s a car service with standards and a mobile app. Craig’s List is online classifieds. Always has been. Likely always will be. Don’t fall for the “see, I’m right” argument unless they go deeper than that. Not all, but most of these collaborative economy companies and ideas stem from Silicon Valley. To borrow a descriptor from a popular standup comedian, the tofu-farting sect is certainly driving the argument for sustainability, thus the collaborative economy. But the neo-hippie movement is as spreadable and sustainable as the off-brand beers they treasure so: Mainstream Americans with money are older and less inclined to drink something that isn’t incrementally better than the piss water with mass distribution its easy to pick up at CostCo. Why feel earthy and creeped out sleeping on some California engineer’s futon when Embassy Suites has free breakfast and happy hour? This isn’t to say there aren’t enough self-righteous hipsters out there to sustain these services and companies in pockets. But try talking a 50-year-old accountant in Little Rock to let a 20-year-old with a face tattoo borrow his Lexus while his band is in town playing at Big Whiskey and see how far you get without being punched in the throat. Owyang and others will tell you they’re on the bleeding edge and always have been. And sure, I could be wrong. But there’s a big difference in sharing pictures of your kids on Facebook and inviting someone to sleep in the guest room across the hall from them. If anything, however, Owyang and the executives in these companies are showing signs that indicate there is substance to the collaborative economy. When brands like BMW and Toyota are getting into the collaborative ride and car sharing business, you know it’s not a fool’s game. Other big brands at the table with collaborative ideas and initiatives include Walgreens, Marriott, GE and U-Haul. There are signals. Brands are paying attention. When you consider Cafepress, the collaborative economy is nothing new. It has connected designers with customers since 1999. But when the competition and market conditions drive the uniqueness of a service like this down, the profits for the makers dwindle. Then you’re left with having to pay too much for good product or settling for less than what the public demands. It forces you to challenge your notion of collaboration. Who knows? Maybe Cafepress can steer all these companies in good directions 10-15 years from now when they run into that problem. The bottom line is that a portion of the market out there is less interested in new, polished and fancy. They’re interested in used, tattered and traipsed upon. Maybe it’s because sustainability is their thing. Maybe they need to feel self-righteous about their impact on the world. Or maybe it’s because their parents spent too little time teaching them the world is a crappy place made up of experiences where you don’t always win. So leather seats, warm towels and room service make up for it. Either way, there’s a fee to be made from helping them find their minimal carbon footprint options. Let the Idiocracy commence. 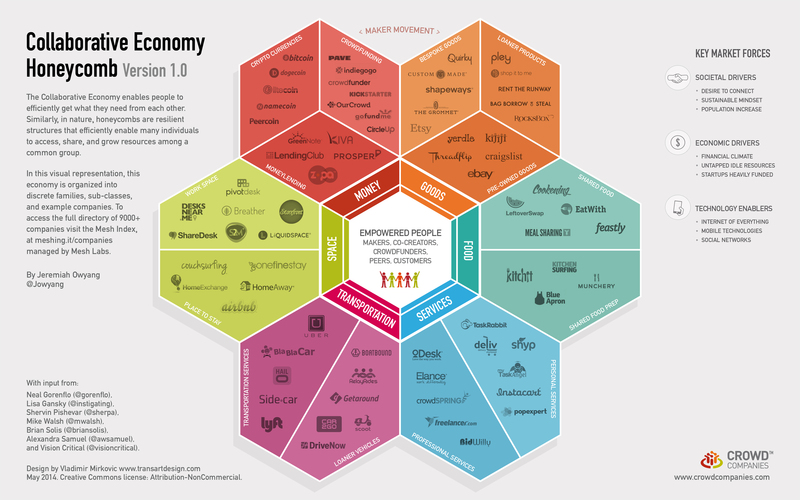 IMAGE: Collaborative Economy Honeycomb by Jeremiah Owyang and Crowd Companies.